This site, created in August 2009, covers my Raitt family history in so far as I have been able to establish and verify facts and relationships. Since there are always a number of other families involved in any ancestry, then the site is also attempting to uncover and provide details on as much about pertinent families as possible. My main master Raitt file, on my computer, does have many branches and twigs - but not all of these appear to be directly relevant to my own main family. Consequently they are not dealt with in any depth here - though I have created pages for other Raitt families (e.g. from Aberdeen, Maryland, Maine, Manitoba and New Brunswick) and other Arbroath Raitts are mentioned on the Scottish Raitts page - and I am always willing to provide information where I can and I invite people who think they might be distantly related or have the same surname to contact me. I am also open to including details of other Raitt branches thus making the site even more useful and accessible. As background I have put up some information on the Raitt name and places associated with it. Details are provided on the various Raitt Coats of Arms as well as those of related families. There is also a timeline for various Raitts in history together with world events at the time, plus information about some famous bearers of the name (and its variants). There are details of my immediate Raitt family tree and its various branches (this is added to all the time) and pictures of diverse ancestors and relatives. 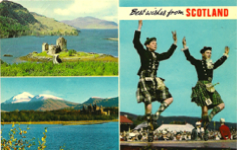 In addition, there is a a blog of my surmisings on the family, as well as reviews of various books relating to Scottish life and history I have read and Web sites I have come across that might be of interest for others to explore further. The blog and background readings also provide some insight into what the social conditions were like at the times in which my (and your) ancestors lived. This is a work in progress and I am continually adding (or plan to add!) additional material that I think might be useful to help Raitt descendants trace their ancestors: better family trees, more photos, census data (like the trees, sometimes duplicated under other family members such as spouses and siblings) and a who's who telling where family members came from and where they moved to, what their occupations were and perhaps what it entailed to be a sea captain, agricultural labourer, servant or flax dresser. I also want to provide a gazetteer of place names and their meanings associated with members of the Raitt family. I have also tried to include as many sources and references to old documents as I come across. Some offer similar details, others reveal conflicting facts. It just shows how difficult it is to piece together information about events that, for the Raitts, started to unfold some 800 years ago. Throughout the pages and on the blog, I have made some comments and observations as to my interpretation of things, but the variety of different records and writings I have provided means that readers can make up their own minds about their Raitt family history. The indexing and navigation could still stand to be improved, but I have added a site map for convenience and names with links to other information should stand out clearly in the text. The site map page also provides details on what has been updated recently and other additions planned (at the bottom of the page). A link to the site map is provided in the navigation menu at the top of each page. The little home icon at the bottom of each page returns you to the site map. I should perhaps note that the program I used originally for this website was iWeb. However, since the program is no longer updated or supported by Apple and since the latest Mac operating system causes font changes and images incorrectly placed when published to the website, then I have rebuilt the site using the iWeb successor named EverWeb which has a similar look and feel - although I am now using the font Verdana instead of Comic Sans. I hope the revamping of the site has gone smoothly, but if anyone notices something odd or links not working, then please inform me. There is also a certain amount of duplication. This is deliberate since it is always a tricky question as to where details about a family should go. It is hard to keep in one place on the website a family which started off in Scotland, moved to say Canada, then to the USA (various states) and back to Canada and whose children also moved to different places and who are all recorded in a variety of places in the various censuses. Of course, there could simply be the whole family from its earliest Scottish ancestor on the one page. However, with the same details, perhaps differently worded, being provided on more than one page then this may prove more convenient and logical for those using this site. It should also be noted that I have tended to leave names, ages, and places of birth as they are given in the censuses in order to show the uncertainty regarding parent’s and children’s places of birth, dates of birth and varieties of spelling as well as different versions and orders of the Christian names. And I have tended to concentrate mainly on male Raitts since these are the ones who carry the name forward in the main. This site has been created in memory of my father, David Raitt, who did much early research into the family history in the days before the Internet and the vast genealogical resources now available online. He ordered numerous old books from the local library, made countless photocopies of the pages therein, visited scores of old graveyards to record the details on relevant stones, tried constantly to stimulate the interest of other family members, and left copious illegible notes! I am sure he would be pleased to know that I have continued the quest, managed to corroborate a lot of what he found out, and discovered much additional information about his own family and its roots. In my original Welcome when I first created this site (at the suggestion of my brother Andrew who gave me the subscription for a website for the purpose for my 65th birthday), I said that hopefully the site would be a historical and genealogical record for my children, grandchildren and Scottish cousins in various parts of the world, as well as my new-found cousins and relatives in the United States of America and Australia and elsewhere. However, it seems that others, who are related in some way, in the distant past, through other branches of the family both in Scotland (e.g. Rait of Hallgreen) and in America, would like to see the site become more of a general Raitt resource as well as a repository for “my” family bits. So, with their help, I am endeavouring to do this - adding more material that puts the Raitts in context as well as tracing better the links between the families. 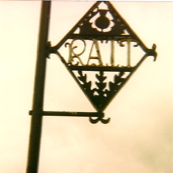 It should be noted that in older Scottish texts and records, the name Raitt, as is shown under the pages on Raitt Name and Raitt Arms (and elsewhere), is spelled in various ways - mainly due to the way it was pronounced since not everyone was literate and in the early days there was no uniform spelling. Thus Raitt, Rait, Reat, Reatt, Rhett, Rhet, Rate, Rayt, Rayte, Rathe (and even Rat and equally possibly Raith) are all used interchangeably to denote members of the Raitt family (often the same person!). All bearers of these names are purportedly all related in the distant past. And as a final word, I have to add this. 1200 years or so ago when the Vikings burst onto the scene, the most important thing for them in an age of oral history was to be remembered for their exploits and adventures, their prowess as sailors and fighters. Lines from the Poetic Edda say “Cattle die, kinsmen die, the self must also die. But I know one thing that never dies: the reputation of each dead man.” We still remember even today the names of famous Vikings and can read about many more ordinary ones in the Icelandic sagas. And so it is that I think people today also want to be remembered – or at least not forgotten. They want their life to have some meaning and purpose. They want to have done something with their lives, achieved something. They want to pass on some legacy to their children. Many people have forgotten their ancestors – or rather they didn’t know anything about them in the first place. It is both astonishing and sad that many people know so little about even their grandparents – and often there is no-one left to ask. It is just as amazing that people can cavalierly sell their heirlooms - their grandfather’s WWI medals, their grandmother’s cooking pot that she inherited from her grandmother and so on. So in these pages I want to try and bring to life some of our ancestors so we can know who they were, how they were related, where they lived, how they died, what their jobs were. So we can remember them, so that they are not forgotten. So that our grandchildren and great grandchildren can learn more about their ancestry and their past and understand the circumstances of their lives – and yes, even know something about us ourselves. And I take special pleasure in the knowledge that this site has brought disparate families together - many for the first time - some related to me, but most not. This makes it all worthwhile - and provides additional material to constantly add to the website. I have put up my own family tree on Ancestry, FindmyPast, MyHeritage, FamilyTreeDNA, GenesReunited, FamilySearch and GedMatch - but this "tree" includes many other Raitts, not directly related to me so far as I know, that are contained in my Raitt Master File (added to enable other Raitt family trees to be easily provided on this site). When I update details etc, then I shall probably update the Ancestry tree first. Please note that the General Data Protection Regulation came into force on 25 May 2018 and relates, particularly, to personal data held on living people. I have created a page that explains what this law is and how this website might be affected by it. See also the Raitt Family Genealogy group page on Facebook which acts as a discussion forum for news and information about families bearing the Raitt name in all it forms. People coming across this website have often enquired where I live and what my Raitt branch is. Some details are buried within the site, of course. However, in summary, my name is David Ian Raitt, I have a PhD and I was born on 2 November 1944 at Folly Farm, Sulhamstead Abbots, Berkshire - a country house dating back to the 1650s which was given over to be a maternity home during the 2nd World War. My father was in the Royal Air Force and my mother in the Women's Royal Naval Service. After leaving university I worked at the Royal Aircraft Establishment, Farnborough, and then moved to Paris in 1969 to work as an information scientist for the European Space Research Organization, which later morphed into the European Space Agency (ESA). After over forty years working first in Paris, then Frascati outside Rome, and finally in Noordwijk, The Netherlands, I retired from ESA at the end of 2009 and am currently still residing in Holland which is where I was last working as Senior Technology Transfer Officer responsible for finding and assessing new every day life applications for space technologies. 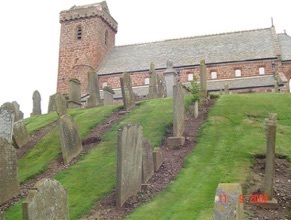 Although my father was born in Glasgow, his parents, oldest brother and his father's two brothers and their families moved there from Arbroath, Angus which is where many of my Raitt ancestors also came from. My great grandfather, David Dorward Raitt, was a master mariner as was his brother James Dorward Raitt and their father John. James Dorward Raitt emigrated to the United States in the early 1870s following his older brother John. Although David Dorward Raitt stayed in Scotland several of his grandchildren also later emigrated to the US and one went to Rhodesia. And several of my own grandfather’s grandchildren have emigrated to Australia and South Africa. My father’s mother’s family (Scorgie) came from Gamrie in Banffshire. My mother’s mother and her family (Lindsay) also came from Angus around Menmuir, Tannadice and Lethnot and Navar, but ended up in Kirriemuir (though some of my grandmother’s siblings went to New Zealand, Canada and Argentina). My maternal grandfather’s family (Taylor) originally hailed from Shakespeare country and were presumably more content with their lives since they did not apparently desire to emigrate.